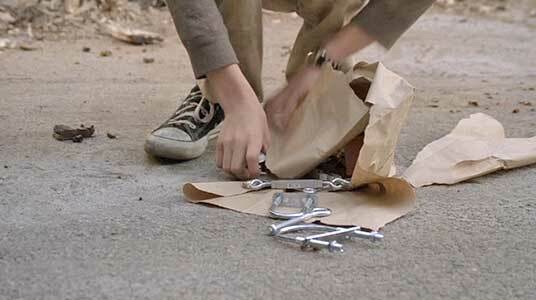 Dylan McLaughlin wears black high top Converse “Chuck Taylor” All Stars in the film. Bobby Graham goes to ask Jim Klecan to review his plans for a soap box car. 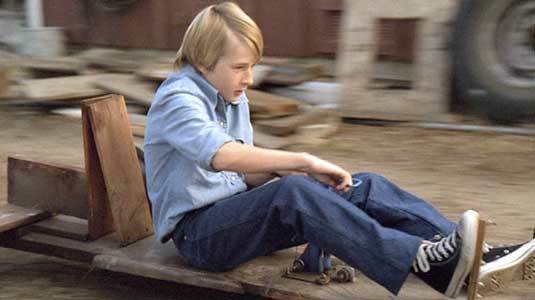 1976 started out as a terrible year for twelve-year old Bobby Graham (Dylan McLaughlin). He lost his parents in an accident, and now he must move from San Diego to the small town of Eagle Rock to live with his Aunt Gayle (Kate Connor) and Uncle Jeff (Jason Brooks). Bobby’s aunt and uncle are very different from his parents. They do not have any children of their own, and their lives are focused around running the family business, the local hardware store in town. Additionally, the family was not close; they hadn’t visited each other for five years so Bobby barely knows them. Part of this was due to the different directions that Bobby’s father and uncle had taken in life. Bobby’s father was interested in designing things, having a family, and building a soap car racer with Bobby. Jeff only is interested in business and running the hardware store with Gayle. When Bobby asks Jeff if he will help him build a soap box car so that he can compete in the local contest, something that he and his late father had planned, Jeff tells him that he has no time for that. The two have a strained relationship at first because Bobby expresses his father’s opinion that just working in a store is not important, and Jeff believes that non-practical activities like building a soap box car are a waste of time. What Jeff wants Bobby to do is go to school and then help him by working after school at the hardware store. To make matters worse, Tommy (Chase Ellison), another kid at school, tries bullying Bobby on Bobby’s first day of school, and when Bobby retaliates by knocking Tommy down, the two are sent to the principal’s office, and their parents/guardians called. This reults in Bobby being grounded for a week, and he is very unhappy with his new situation. 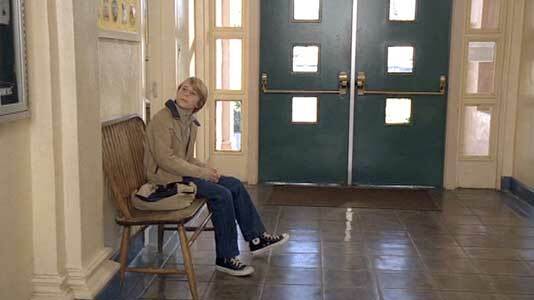 Bobby waits outside the principal’s office. While Bobby was waiting for the principal, he sees a display cabinet which contains the National Soap Box Championship trophy that was won in 1952 by Jim Klecan (John Schneider). As they were driving into town, Uncle Jeff warned him to stay away from Jim, although he wouldn’t say why. Jim was a Viet Nam war veteran who came back greatly changed by the war, and now living as somewhat of a recluse. Around town kids spread rumors about Jim that he is a dangerous person who experiments on dead bodies and collects human skulls. Bobby is determined to pursue his dream of building a car and competing so he goes over to Jim’s property, gets his courage up, and asks Jim if he will look at his proposed design for a soap box car. Jim doesn’t want to be reminded of the past and gruffly sends Bobby away. But Bobby is persistent and comes over again with a new design. Jim tells him that his father should be the one to help him, and Bobby says that he doesn’t have a father. This gets to Jim, and he grudgingly agrees to review Bobby’s plan. Over several meetings, they begin to develop a relationship and start the work of designing and building a soap box car. Jim is adamant about one thing: he is happy to provide advice and coaching but Bobby must do all the work of building the car himself. Jim turns out to be an excellent mentor, with quite valuable information about how to design a car and how to compete in a race. Bobby has one other big problem: Uncle Jeff is expecting him to be at the store after school not off building a soap box car. So Bobby tells him a big lie: he is trying out for the school baseball team and the coach says he has a very good chance of making the team. 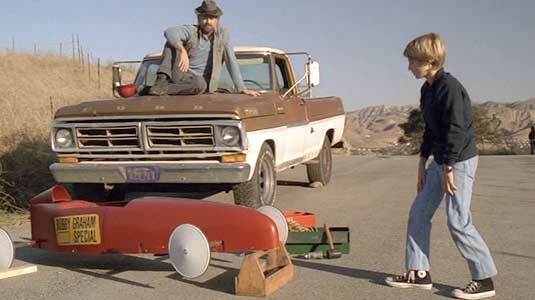 Eventually Jim and Bobby become friends, and Jim helps Dylan learn about soapbox car design and strategy. Two other elements in the film are also important. Bobby’s teacher, Miss Jackie Nelson (Bitty Schram), takes him under her wing at school and later in his personal life. At first Bobby is so unhappy he refuses to finish his school work, spending class time making drawings of cars. But she calls him aside, and tells him that she knows he is capable of so much more, having seen his grades from his previous school. Eventually she gains his confidence and Bobby begins to excel at school again. He is especially gifted in mathematics, something he got from his father. Miss Nelson also advises him that Jim Klecan is an okay person, not the demon that rumors make him out to be. The second element is the competition that develops between Bobby and Tommy, the kid who was on Bobby’s case from the very first day Bobby came to the local school. It turns out that Tommy is the current soap box car champion in Eagle Rock. We discover that soap box car racing in Tommy’s case is not so much about his interest, but rather his father Dennis (Mark Billings) is obsessed with Tommy winning and he is very controlling in how he does this. Tommy is allowed no input in the design or even to assist in building his soap box car. Any time his father senses failure, Tommy is berated. With that kind of pressure on him, it is not surprising that Tommy takes it out on other kids, especially someone like Bobby who he sees as a threat to his position as local champion. The story continues with the preparations for the big soap box car competition for a trip to the national championship, how Bobby learns to compete and fulfill his dream of becoming a successful racer, and the inevitable fallout when his Uncle Jeff discovers that Bobby has been lying to him. 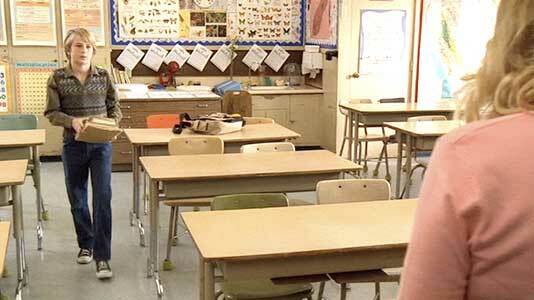 Bobby’s teacher encourages him to excel in school again. You’ve Got A Friend is another fine film in the Hallmark series of family films and one of the last ones produced for their long running television show on NBC. 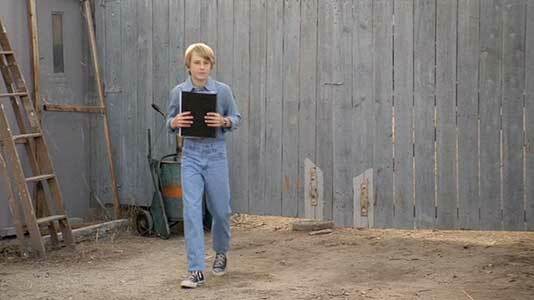 Some of the best films in the series feature young lead characters wearing high top chucks, (Journey, To Dance With the White Dog, Anya’s Bell, and The Runaway) which makes them an even more satisfying film to watch from our perspective. These films are always well produced and provide a number of positive messages. The title of the film not only refers to Bobby, the twelve-year-old kid adrift in life after suddenly becoming an orphan, but also to Jim Klecan, a Viet Nam veteran who was serving overseas when his father, his only remaining family, died. Additionally Jim suffered the loss of many of his platoon members, who were killed or missing in action during the war. This caused him to seek isolation and exhibit anti-social behavior, doing nothing other townspeople saw as positive and dropping out of their normal social lives. (In today’s world we would understand that Jim was suffering from a light case of post traumatic stress syndrome.) The positive message there is how they both end up relying on each other as Bobby helps Jim get out of his isolation and become involved again in other people’s lives. The film begins to hint at a possible relationship between Jim and Bobby’s teacher, Jackie, although there isn’t much follow through on this. And the main positive message, especially to kids, is about how it is very important to follow your dreams, even in the face of adversity. As is typical with these films, the preaching is kept very low key, and the action of the film speaks for itself. Fine performances by John Schneider and Dylan McLaughlin make this an enjoyable watch for the entire family. Jim and Bobby look at the completed soapbox car. Bobby tests out his soapbox car design. Dylan McLaughlin in his role as Bobby Graham wears black high top chucks throughout the film. Chucks are the perfect sneaker for a determined young twelve-year-old kid with an independent streak and a desire to succeed. The cinema photography is pretty chucks-friendly in this film. The best shots are when we see Bobby testing out his soap box car designs. Bobby leans down to pickup some spilled hardware..
You’ve Got A Friend. (2007) Dylan McLaughlin, John Schneider, Jason Brooks, Kate Connor, Mark Ralston, Bitty Schram. Directed by James A. Cortner. Categories: Family, Drama.